Installing a new Atlas Copco ring main and variable speed driven (VSD) compressor with ancillaries is calculated to result in an annual carbon reduction of approximately 48 tonnes of CO2 for award winning magazine printing company, Buxton Press – along with close to £7,500 per annum savings in compressed air energy costs. Based in the picturesque Derbyshire market town of Buxton, forward-looking family-owned business Buxton Press is one of the UK’s leading independent litho sheet-fed printing companies. It specialises in printing paginated magazine and catalogue work for weekly, monthly, bi-monthly, quarterly and annual distribution. 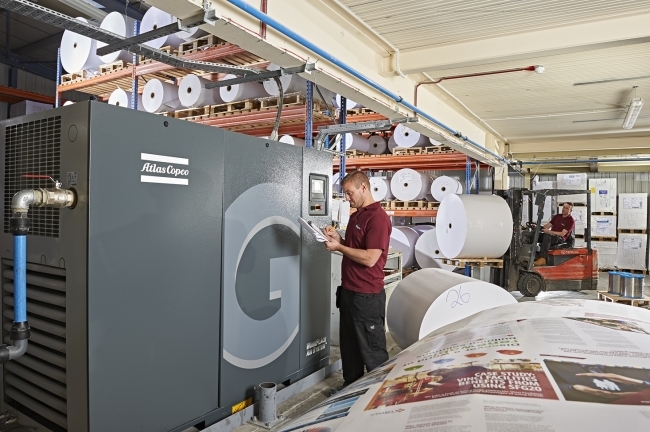 The company’s ultra-modern print production plant features a state-of-the-art installation of multi B1 long-perfecting CutStar supported printing presses. 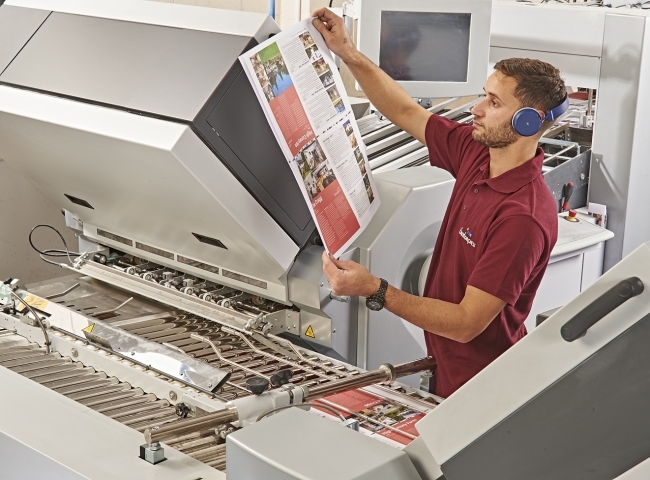 Annually it is responsible for printing some 54 million publications, equivalent to 23 million four-colour A4 pages a day, for more than 600 publishers. Such a throughput necessitates operating 24/7 to meet the requirements of new and established business opportunities. This exerts a corresponding increased demand on the company’s production infrastructure and, subsequently, on the essential compressed air requirements of its three daily production shifts. As a winner of the Environmental Company of the Year award and mindful of its geographical location, environmental considerations underpin the Buxton Press business ethos. 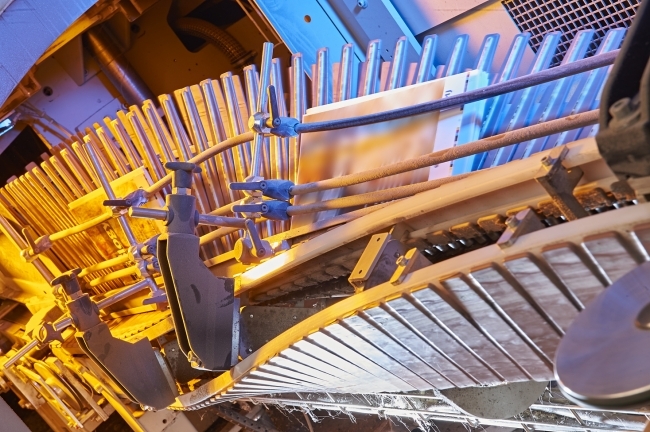 As such, the company called in Atlas Copco to run an iiTrak survey to audit its air generation efficiencies and measure the load profiles of the ring main linking the two existing fixed speed compressors. The results indicated that the level of air leakage from the existing pipework was high. Coupled with excessive pressure drop this was contributing to an annual compressed air bill exceeding £30,000 a year. The recommended course of action was to completely re-route a new 2 ½ inch AirNet ring main and add an energy-efficient 7 bar GA 75 VSD FF full-feature rotary screw variable speed drive compressor, complete with integrated refrigerant drying and air quality ancillaries. The VSD compressor would continually match the variable compressed air pressure requirements throughout all shifts; with the two-existing fixed-speed compressors to be retained for back-up supply generation. The compressed air supplied via this ring main runs the smaller printing presses, the gluers, binders and stapler machines. The new re-routed ring main system allowed the generated air pressure to be lowered by 2 bar, with a constant energy saving in the region of 12 per cent. Based on the company’s average day-shift and night-shift rates, it was calculated that the recommended installation would achieve an overall 25 per cent saving in Buxton Press’s annual air generation costs.